I wonder if there is any benefit in a collaboration to buy a few rather than one-off. I know quite a fair bit of the costing is cutting time which obviously scales but there must be a significant overhead as well. Plus one could put 2 or 4 together to make a rectangular shape and maybe help with cost on that front. Possibly, i could get a re-quote for 10, 25, 50 pieces. 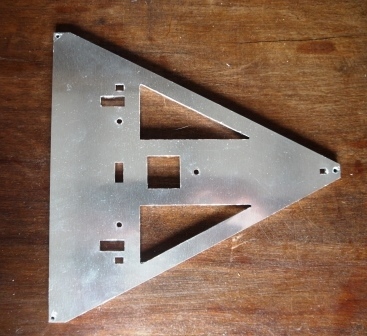 I could cut the raw shapes on my CNC plasma table but it would not be able to put the small cut-outs in that way which makes it a two process job. Ok i have some prices for multiple part order by laser cutting..
Its better, would there be any interest in this??? I'm definitely up for going in on the laser cut bed purchase . Ok, how much are we willing to pay? I.e. what quantity do we need to hit before it reaches the price we are happy with?? I will have one of course, and that's two others so far. If we hit 10 I think that's £16.50 a piece plus outward P&P, probably only £3 ea. Please note that I opted for the version without the small holes for the 3 bed screws. Apologies and credits also to the OP MrCrispi for designing and posting the file in the first place, I hope you are agreeable with my proposition? Edited 2 time(s). Last edit at 03/06/2014 08:56AM by Davek0974. I would like to join in but i'm not sure if you are willing to deal with international shipping (to switzerland in my case). I would have no clue how much shipping would be but in total i would be willing to pay up to 40 gbp max (incl. shipping). I would guess it would be easily done for under your limit. I'm definitely in for one at any of those prices. Is it really not possible to laser drill the 3 small holes? Their position is quite critical. Even if you can only have a 1.5mm or 2mm pilot holes drilled, that would be a big advantage. Or, you could make the whole triangle slightly bigger and move the holes in from the corners a few mm. 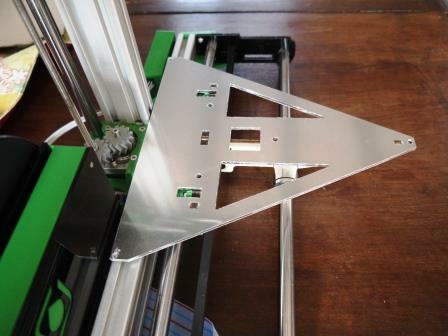 The print head can move at least 10mm beyond the front of the bed, so moving the whole bed forward a few mm so as to keep the holes further from the edges would be OK. So, with the heater connections on the right as you look at it, adjust shape, move the bed slightly right and make pilot holes? Should be ok, doubt three piercings would affect the cost much. Numbers are on the increase, great work. Looking good, we're up to 10 units, I'll wait a little more while looking at the slight mod mentioned above, maybe we can get the price down a bit more. Everyone ok to pay with paypal? Paypal fine for me. Having the holes or pilots would make it easier. I would be well interested in getting such bed. 2. I can do paypal, and based on London if you somewhere around (pretty much in London ) I can easily pick it up from you to make your life with postage eisier. Can I also request one of these as well. Paypal is fine by me. Yes PayPal OK for me. I'll take one as well, with shipping to Denmark. And PayPal is perfect. Edited 1 time(s). Last edit at 03/07/2014 05:34AM by spiff. Sounds like we're almost good to go, I have modified the DXF slightly to shift the relative position of the three critical bed mount holes towards the pointy end a little and given more meat around the hole locations, I have also provisioned the three points as 2mm piercings or pilot holes. I will reconfirm if the price has altered slightly and get an order drawn up today for the first batch. Will let you know the progress. Edited 1 time(s). Last edit at 03/07/2014 06:25AM by Davek0974. For the two i have ordered i am fine with PAYPAL. Just let me know when and how much it ends up at. Great. Looking forward to this. Can you make the modded dxf available? Paypal is good with me.